Having a glass of wine with dinner and thinking about driving? That might be a bit more of a gamble in the future, as the National Transportation Safety Board is lobbying states to reduce their thresholds for drunk driving from the national standard of 0.08 blood alcohol concentration to 0.05. Members of the board presented their case this week in New England, reports WTKR.com, saying the new standard could help save lives. “If you are impaired and behind the wheel, you should not be driving,” said an attorney with the local chapter of Mothers Against Drunk Driving. With a BAC of 0.05, he says drivers are a danger to themselves and others on the road. 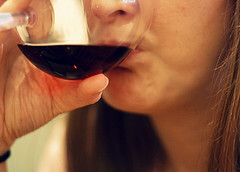 But a restaurant trade group says that could come to a single glass of wine at dinner for some, so lowering the threshold for a DUI could strike a blow into the heart of their business, a spokeswoman for the American Beverage Institute says.